Have you seen the trailer for Marvel’s Thor Ragnarok? I just love the futuristic look and Thor’s new hair… Looking good! Be sure to check out the colorful spellbinding new poster, I love it! 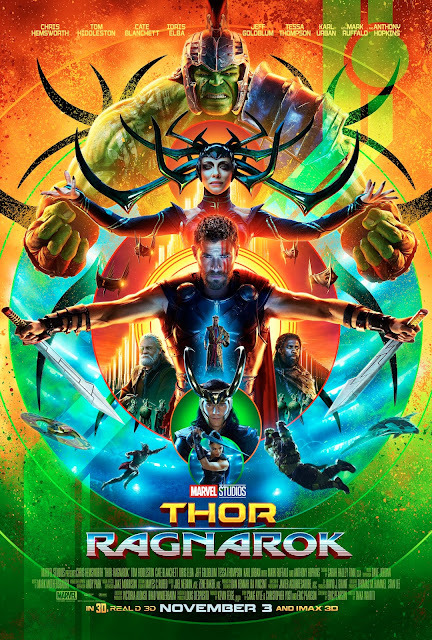 Marvel’s Thor Ragnarok opens in theaters everywhere November 3rd! But first he must survive a deadly gladiatorial contest that pits him against his former ally and fellow Avenger—the Incredible Hulk! THOR: RAGNAROK is directed by Taika Waititi and returns Chris Hemsworth starring as Thor and Tom Hiddleston reprising his role as Loki. They are joined by Cate Blanchett, Idris Elba, Jeff Goldblum, Tessa Thompson and Karl Urban, with Mark Ruffalo and Anthony Hopkins. Are you excited to see Thor Ragnarok? My brother would like this movie.